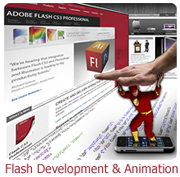 Flash Development and Animation is all about creating stunning eye-catching and innovative presentations that get noticed by the visitors easily. Fierce online competition has made it important to stand out with extraordinary promotional techniques that grab viewers' attention effortlessly. Brainpulse offers infinite opportunities for creativity and facilitates development of interactive software range. Today, Macromedia Flash has secured its space as an incredibly influential technology that makes website extraordinarily remarkable and customer centric. Smart use of this technology design has completely surpassed the magic of other conventional mediums. With affluent presentation of concepts through graphics, its power presented a flexible podium to create long lasting impact on the visitors. For our valuable customers, our Flash development services India create a range of advanced applications using FlashMX, Flash Communication Server to harness its potential. It is a powerful tool for Animated Multimedia applications. Largely accepted technology, Flash Animation has given the power of creating completely interactive real-time presentations on the Web. BrainPulse Technologies has qualitative experience in creating winning edge products varying from simple Flash Websites, Banners, Intro pages and animation presentations via Flash development services India. Our precise use of colors in animated designs are attractive enough to earn great recognition. Why Flash Development @ BrainPulse? BrainPulse Flash development services team has expertise that spans through today's widely used internet technologies and meets the ever-growing needs of clients and their businesses. Our main competencies range from Comunication server, Adobe AIR and Adobe Flex.